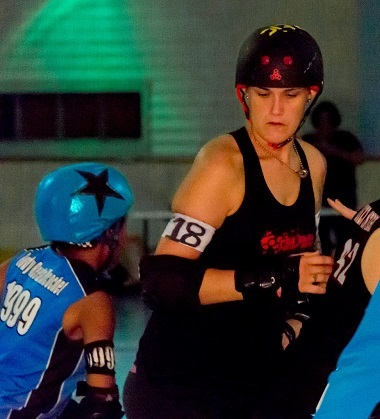 Red Stick Roller Derby | July’s All-Star of the Month: Captain Twitch! ← July’s Capital Defender of the Month: Toni Smasheries! July’s All-Star of the Month: Captain Twitch! My name and the J in my number is the combination of nicknames from three of the most important people that were in my life so why not play in memory of them and let them continue to be a part of what I love. My number 18 is the number I’ve had all my life playing sports and is my favorite. I love how it is constantly evolving and is very strategic. I love having a challenge from day to day and that is what derby is, it seems like if you miss a practice you have missed so much. Also the hitting part is pretty fun too. I knew absolutely nothing about roller derby when I started but once Jams P. Skullivan and Little Miss Maggot talked me into joining the fresh meat class I was instantly hooked! That roller derby is unlike any other sport out there that I have played. You are not just teammates, you are one huge family and that is one of the greatest feelings to have. It puts a whole new perspective on what we are taught about not judging a book by its cover because everyone has their own story and background. My goals are to just keep progressing in the sport and learn anything and everything I can to be a better player, not for just myself but for the team. I haven’t been playing long but so far the most memorable was playing Acadiana Rollergirls and I managed to get their jammers to cut twice in that bout giving us two power jams! I recently just bought 187 killer pads and love them. I also just switched to Antik skates and wish I had started out with them because they are awesome. RED STICK, PURPLE STICK, OI, OI ,OI!! That would be Val Killmore! I feel like I work well Honey Badger Von Sparkles and really everyone else on the team. It seems that we all just click and know what to do with everyone. I have been playing soccer since I was 12 or so. I also used to race four wheelers and dirt bikes to keep myself busy on the weekends. If I’m not skating, I’m at work wishing I was skating or I’m reading about what I can try to make myself a better skater. Or trying to catch up on sleep!! Do it! Don’t think twice about joining and just go for it. It will change your life in the best way! I had never quad skated before I started so don’t let that scare you off! In the February 2013 fresh meat class.